"The Pilgrims set ground at Plymouth Rock on December 11, 1620. Their first winter was devastating. 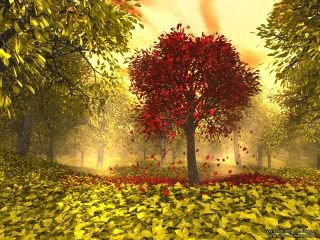 At the beginning of the following fall, they had lost 46 of the original 102 who sailed on the Mayflower. But the harvest of 1621 was a bountiful one. And the remaining colonists decided to celebrate with a feast -- including 91 Indians who had helped the Pilgrims survive their first year." 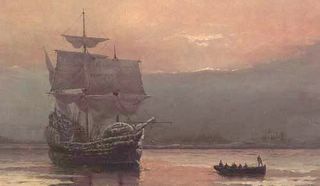 The Mayflower was the ship which transported the Pilgrim Fathers from Plymouth, England to "North Virginia" (in what was later to become the United States of America) in 1620, leaving Plymouth on September 6 and dropping anchor near Cape Cod on November 11. A reconstruction of the 1627 village occupied by the Pilgrims. 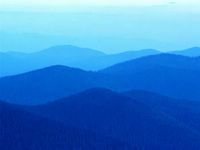 Massachuset: Meaning ">at the range of hills," and meant the Blue Hills past Milton. The Massachuset belonged to the Algonquian linguistic stock, their tongue being an n-dialect, and formed one group with the Narraganset, Niantic (East and West), and Wampanoag, and probably the Nauset. In the region of Massachusetts Bay between Salem on the north and Marshfield and Brockton on the south. Later they claimed lands beyond Brockton as far as the Great Cedar Swamp, territories formerly under the control of the Wampanoag. 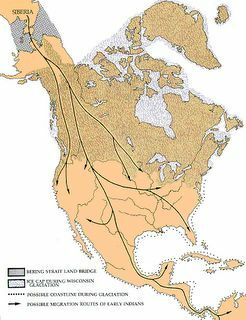 "Most anthropologists today believe that the ancestors of all American Indians immigrated from northeastern Asia across the Bering land bridge during the Ice Age, between 12,000 and 60,000 years ago. 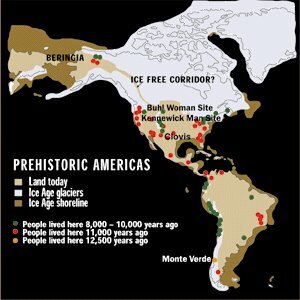 Known as the Bering Strait theory, this idea is supported by archaeological, biological, and geological evidence."